Like all other flora and fauna of our planet, what we have considered the most common, have steadily declined, due to various reasons. So it is exciting to find a population of a declining species, which was considered common earlier, in a remote, undocumented area. For the past 40 years, the total number of Adélie Penguins, one of the most common on the Antarctic Peninsula, has been steadily declining—or so biologists have thought. A new study led by researchers from the Woods Hole Oceanographic Institution (WHOI), however, is providing new insights on this species of penguin. In a paper released on March 2nd in the journal Scientific Reports, the scientists announced the discovery of a previously unknown “supercolony” of more than 1,500,000 Adélie Penguins in the Danger Islands, a chain of remote, rocky islands off of the Antarctic Peninsula’s northern tip. “Until recently, the Danger Islands weren’t known to be an important penguin habitat,” says co-PI Heather Lynch, Associate Professor of Ecology & Evolution at Stony Brook University. These supercolonies have gone undetected for decades, she notes, partly because of the remoteness of the islands themselves, and partly the treacherous waters that surround them. Even in the summer in the Southern Hemisphere, the nearby ocean is filled with thick sea ice, making it extremely difficult to access. When the scientists arrived in December 2015, they found to their great excitement, hundreds of thousands of birds nesting in the rocky soil, and immediately started to tally up their numbers by hand. The team also used a modified commercial quadcopter drone, to take images of the entire island from above. “The drone lets you fly in a grid over the island, taking pictures once per second. You can then stitch them together into a huge collage that shows the entire landmass in 2D and 3D,” said Hanumant Singh, Professor of Mechanical and Industrial Engineering at Northeastern University, who developed the drone’s imaging and navigation system. Once those massive images were available, he says, his team can use neural network software to analyze them, pixel by pixel, searching for penguin nests autonomously. 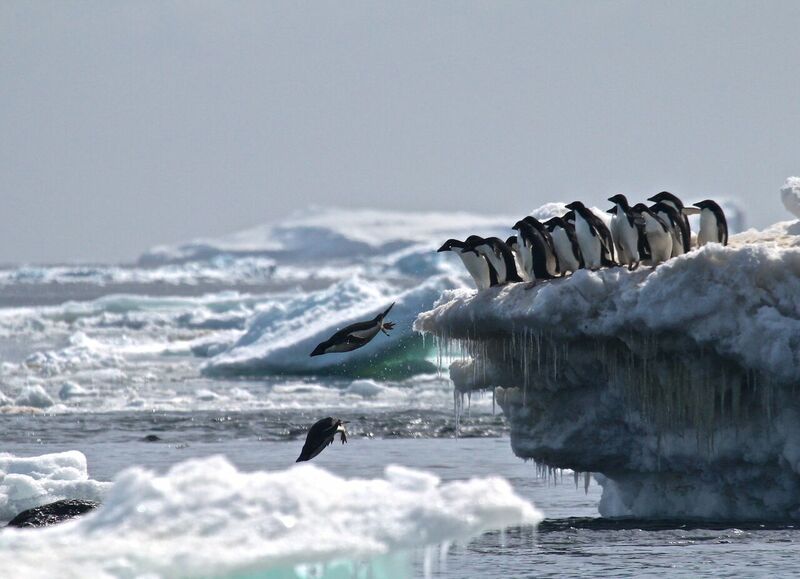 The researchers found that the Danger Islands have 751,527 pairs of Adélie penguins—more than the rest of the entire Antarctic Peninsula region combined. 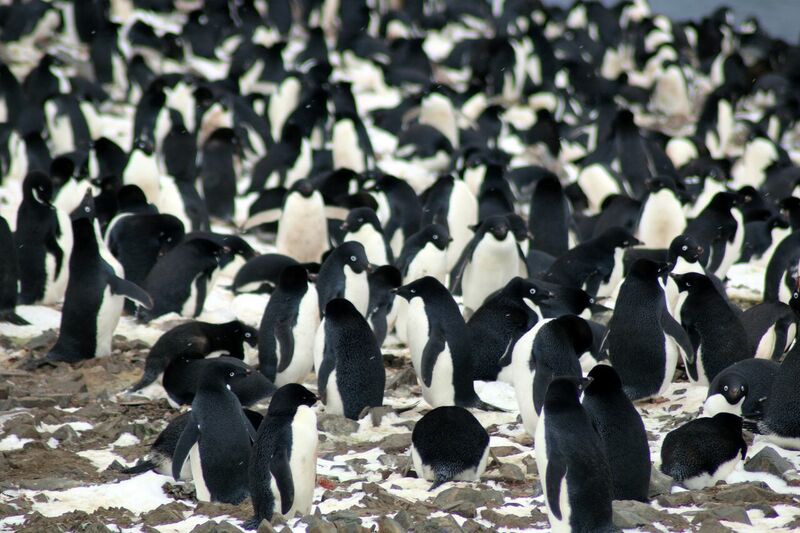 They include the third and fourth largest Adélie penguin colonies in the world. Because the Danger Islands have a large number of Adélie penguins and are likely to remain an important breeding location for penguins under projected climate change, the researchers say they deserve special consideration in the negotiation and design of Marine Protected Areas in the region. Also collaborating on the study: Alex Borowicz, Philip McDowall, Casey Youngflesh, Mathew Schwaller, and Rachael Herman from Stony Brook University; Thomas Sayre-McCord from WHOI and MIT; Stephen Forrest and Melissa Rider from Antarctic Resource, Inc.; Tom Hart from Oxford University; and Gemma Clucas from Southampton University. The team utilized autonomous robotics technology from Northeastern University. Funding for this research was provided by a grant to the Wood Hole Oceanographic Institution from the Dalio Ocean Initiative and Logistical support was provided by Golden Fleece Expeditions and Quark Expeditions. The Woods Hole Oceanographic Institution is a private, non-profit organization on Cape Cod, Mass., dedicated to marine research, engineering, and higher education.